'Just paradise', as one of our guests said. Very true. But unfortunately, we can't go there ourselves every week. 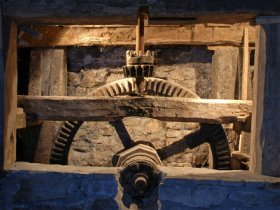 So you also get a chance to enjoy the quietness, the authentic house aged 200 years (or so) and the mill wheels that are still present. Take a view of the mill and surroundings from above, filmed with a drone by one of our guests. In summer you can have breakfast in the sunny garden from 9 AM onwards (fresh bread is 2 minutes away) and barbecue in the sun till 8 PM. In autumn you can trace and pick your own mushrooms close to the mill, and eat them for lunch or breakfast. Though the water is close, mosquitos are not a problem. Position Moulin de Laval is located just outside the village of St Priest des Champs (click for position on Google Maps), in the Auvergne, Central France, about 530 miles away from London. The highway is 45 minutes away. Of great joy are the immense green gardens on both sides of the mill, the rustic but modern kitchen, the newly tiled bathroom, free wifi plus laptop and the flatscreen television and some 50 dvd's of good taste. From the kitchen one can see the brook and the garden. 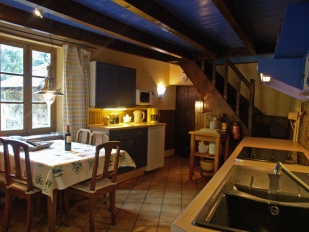 The kitchen provides a view at the brook and the garden during all meals. There is a dish washer, a hot air and microwave oven, a ceramic cooking plate, a corkscrew, a Nespresso machine (some free capsules) and all other regular conveniences. The scullery contains an extra fridge, a separate freezer and a washing machine. The modern bathroom has a bath tub, a shower, a sink and a bidet. Toilet in a separate room. And then there are a telephone (free calls to landlines within Europe), brooks and brooklets (Auzelle, Auzellette, Pierrette) and lots of peace. The Auzelle flows into the Cascade de St Priest, a small waterfall about 500 yards from the mill. It's a nice walk, in summer you can even get there wading through the brook. Take your boots! 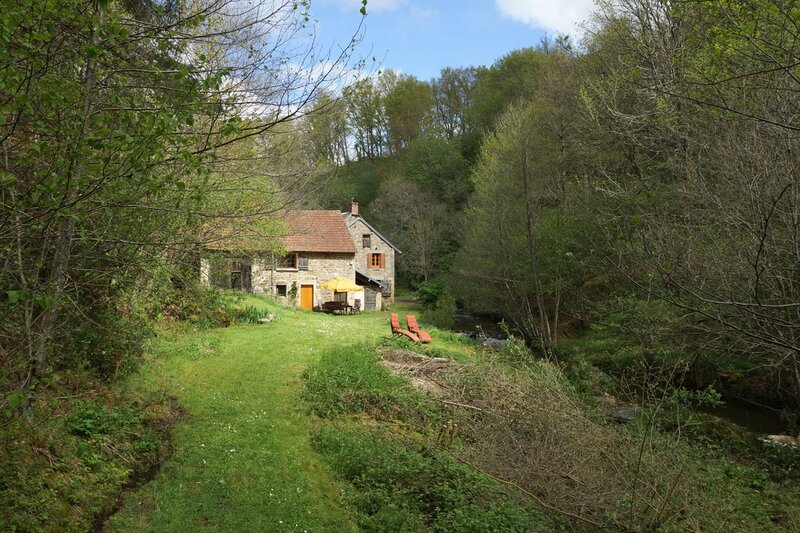 How many people can stay in Moulin de Laval? Eight adults can dine at the resizeable table in the kitchen. There is no limit to the amount of people that can eat in the gardens. In the grass room you sleep amidst pastures under a blue sky. 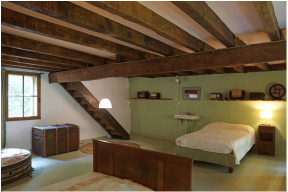 There is a single bed in Jugendstil style and another bed, a cupboard for your clothes and a cot (bed for kids), that can also be taken to other rooms. All bedrooms have wooden floors and are (electrically) heated. The forest room offers views to the forest on both sides. 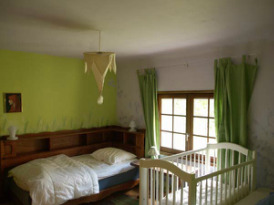 It is the largest room in the house and contains a double an a single bed. The forest room, with millstones and small collection of bakelite radios. The terrain is surrounded by fences, the brook, steep hillsides and thickly grown bushes.